The Governors are of the opinion that uniform standards are very important indeed and it is their policy that students are required to be dressed according to the following lists. 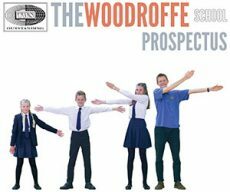 All these items of uniform and sportswear can be obtained at highly competitive prices in the School Shop (Tel: 01297 445 435). Blazer: Traditional single-­‐breasted, navy blue, with school badge. Skirt: Tailored navy blue, either straight, with pleats or gathered, waist to knee (no extremes). OR Trousers: Smart, tailored, straight leg navy blue as shown/sold in the school shop. Hems should be off the floor (baggy ‘fashion’ or skinny fit trousers are not acceptable, and neither are jeans, jean style trousers, corduroys, leggings, culottes or shorts). Belt: Any narrow belt, same colour. Pullover: V-neck, plain navy long sleeved, no logos. OR Cardigan: V-neck, plain navy, no logos (round necked pullovers/cardigans are unacceptable). Shirt: White poly/cotton, normal shirt style collar and long sleeves to tuck into skirt/trousers. School tie: To be worn at all times except with polo shirt in the summer term. For all years, navy clip-­‐on with the school badge obtainable only from the school Shop. Shoes: Smart, plain black or navy low heeled shoes with no visible logo (high heels are unacceptable as are trainers and boots). Socks or tights: Navy/black with trousers, white/black/navy with skirts (no trainer socks). Outdoor coat: Functional plain blue or black (denim jackets and army camouflage coats are not acceptable). Physical Education: Navy shorts or skorts (skirt and shorts combined); hockey socks-­‐red; hockey shirt – navy/red reversible OR navy badged hoodie; plain short sleeved red polo shirt; hockey [or football] boots; white ankle socks; training shoes/plimsolls; shin pads; gum shields; towel. Optional: Navy tracksuit, navy badged hoodie. All students are advised to wear fluorescent armbands when outside after dark. 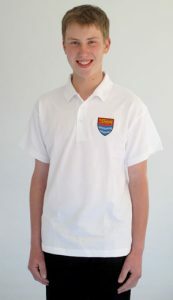 Short sleeved shirt OR Polo shirt: White short sleeved embroidered with school badge are optional for summer term and will not be available until the summer term. Blazer: Traditional single-­‐breasted navy blue with school badge. Trousers: Dark grey/charcoal (not black). Hems should be off the floor (baggy ‘fashion’ or skinny fit trousers are not acceptable and neither are jeans, jean style trousers or corduroys). Belt: Any plain narrow belt, same colour. Pullover: V-­‐neck, plain navy long sleeved, no logos (round necked not acceptable). Shirt: White poly/cotton (with normal shirt style collar and long sleeves). Shoes: Smart, plain black shoes with no visible logo (trainers and boots are unacceptable). Socks: Navy, grey or black (no trainer socks). Outdoor coat: Functional plain blue or black (denim jackets and army camouflage coats are not acceptable). All students are advised to wear fluorescent armbands when outside after dark. Physical Education: Navy blue shorts; trainers/plimsolls; navy/red reversible rugby jersey; Football boots; white short socks; plain short sleeved red polo shirt; towel; football/rugby socks -­‐ red; shin pads; gum shields. Protective clothing for art, craft & science (adult’s old shirt is ideal). Bag – Sturdy waterproof with zip or fasteners for carrying books. Separate bag for games kit. Rough work book, pens, pencils, etc. Please note: all items worn or brought to school must be labelled clearly with the owner’s name. Make-­up – No make­‐up is permitted. Jewellery -­ Permitted jewellery for all is one ring, a watch and one sleeper or ear stud in each earlobe. Spacers, plugs and facial jewellery may not be worn in school. While recognising that each student will wish to wear her/his hair in an individual style, the Governors are not prepared to accept extreme hairstyles which are not in sympathy with the school ethos which emphasises traditional values, neatness and tidiness. The Governors have delegated decisions within these policies to the Headteacher who will, if necessary, refuse entry to a student until such time as his/her uniform, hairstyle or appearance is deemed appropriate. All students are required to be clean shaven and any student entering school with facial hair will be provided with shaving equipment by the school’s Welfare Assistant in order to remove it.